There's something breathtaking about roses in late autumn. Perhaps it's a last exhalation of summer or perhaps it's the beautiful contrast of pink against the fading green landscape. I breathe them in deeply as I want to remember them after the cool dark skies settle in for the season. just divine! You grow the most amazing blooms! Wow! What kind of roses ARE those? A late rose is such a wondrous gift of summer memories. I can almost smell their fragrance in your gorgeous photograph. There's a rose garden in Regent's Park here in London and I love going there to smell the beautiful scents. Just wonderful! So beautiful, I have the same ones in my garden. Mine are no longer blooming. Winter is on its way here. absolutely beautiful - I love David Austin roses - so old fashioned and elegant. They're gorgeous. Thanks for posting the site! Beautiful! Remind me of Peonies a bit. WOW... those roses look huge... just like peonies! The roses are absolutely beautiful....too beautiful for words. 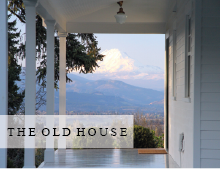 I love your blog and the photographs of your renovation. Gorgeous! I love the pink! Your site always makes me smile. What a great image to start the day! "Roses bloom in summertime so that we can remember their scent when winter falls." I love roses (and I have someones in my garden ) and these look georgeous!! and Im agree finally of summer in autumn the roses are special, something in the weather maybe not so hot. I just started growing roses this year so I didn't see a lot of blooms. So looking forward to what delights next year brings! Your photography talent is as good as your green thumb! Wow! You nailed the essence of beauty in this post! These are JUST beautiful and your photography is wonderful. They are beautiful. Your photographs are amazing. We are enjoying the last of our roses, too. They have thrived this Fall. Beautiful as always...and even though I'm enjoying fall very much, I'm now thinking of next years spring and summer...which is a very nice thought indeed! So beautiful, I can almost smell it! My best to you and your precious family! Well said... I love these late lingering bloomers! We had an October snow here in Eastern PA. It was really something seeing the roses covered in white! They are so beautifully cupped. Such a beautiful photograph. 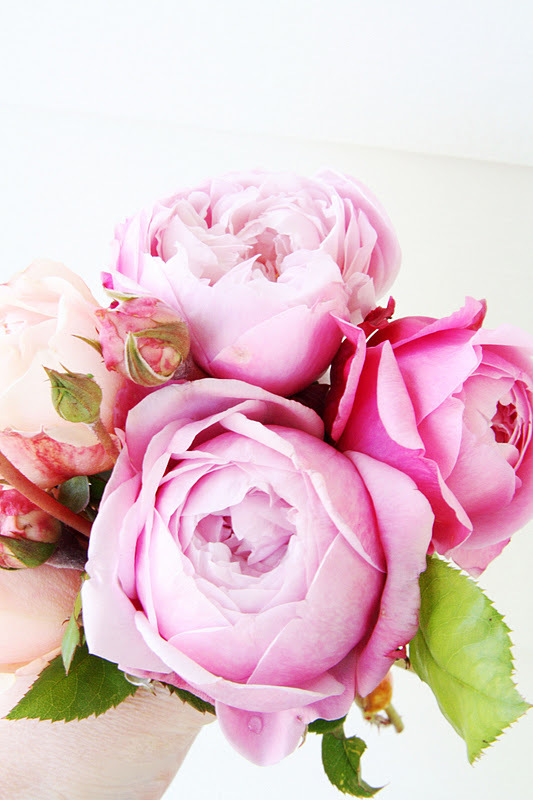 Those are beautiful :) I love roses, especially David Austin roses. I do always enjoy what may seem to you like idle musings lol but your beautiful home and your beautiful family help us wee bloggers to appreciate the beauty in the simple things :-) Your roses are divine, as are your other glorious garden flowers. These roses, I must say, look quite similar in shape to a Pierre de Ronsard standard weeper we have in our garden. By the way, I was telling a friend about the picture of your hubby holding all those ladybirds! Spent almost 2hrs hunting for it on your site...obviously missed it. Where can I find it? What a beautiful bouquet! Roses in fall are such a treat. Your life looks so sublime. Your photos delight. Hi Karen, You can always do a quick search for things in the Google search box (just above 'Featured In'). These are SO breathtaking! Hope you and your family are enjoying falls bounty. What beautiful roses...and in my favourite colour! I just stumbled across your lovely blog & have signed up as your latest follower. I have just been enjoying myself going through some of your older posts I look forward to popping back for some more 'country' inspiration! I am awaiting my David Austin Roses to arrived--not so patiently I may add. I love to paint roses and I can't wait to paint the ones I ordered. :)How long did it take for them to bloom for you? And what variety is shown on your photos? I just wondered by your blog and I LOVE it! So far I've planted the varieties Geoff Hamilton, Windemere, Glamis Castle and Heritage by David Austin. I think the variety in this photo is Heritage. They bloom the first year but the flowers are small. By the second year they should be a nice size.